How to Draw a Horse. Horses are one of the most popular subjects for drawing. Their grace, beauty and power have fascinated artists for thousands of years. Drawing a horse isn't difficult. It just takes practice and a little knowledge of the anatomy of the horse. Start with a good drawing of a horse. A drawing is best for practice because it's easier to see the lines that make up the horse's body. Lightly pencil a center vertical line down the middle of your paper. This will help you position your horse and proportion it correctly. Lightly add a second line on both sides of the center halfway between the center line and the edge of your drawing space. In the furthest right section, sketch in the shape of the head. It's just an elongated trapezoid with the nose end about half the length of the neck end. Be sure to make it big enough. 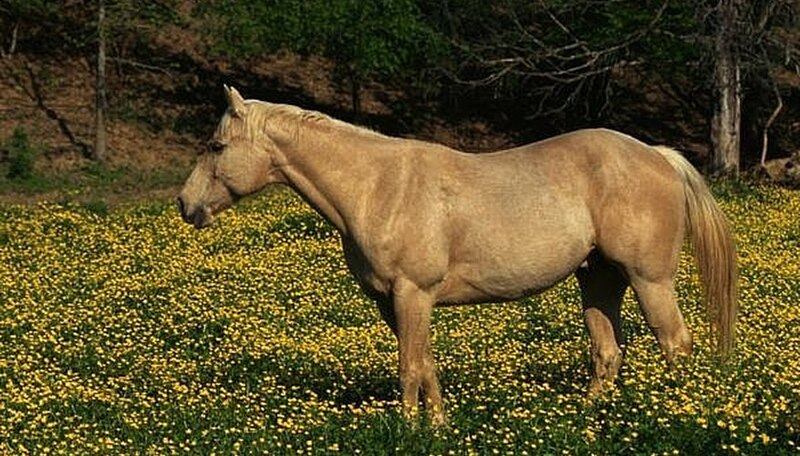 The head of a horse from nose to cheek is nearly one-fourth the length of its body. Add a small triangle for an ear at the top corner of the trapezoid. Draw a smooth, downward-curving line from the base of the ear to the center line of the paper. This is the upper line of the neck. Draw a horizontal line with a slight curve from the end of the neck to the third line on your paper. This is the horse's back. Draw the horse's rear--an elongated S curve that is 1 1/2 times the width of the head. This is the horse's rump and top of its rear leg. Draw a slightly curving line from the bottom edge of the head downward. The line should be just slightly longer than the horse's head is wide. This line is the outer curve of the horse's neck and the front of its body. You should be able to see the horse's shape starting to emerge now. Sketch in the foreleg with two straight lines--one from shoulder to knee and one from knee to hoof. Draw a shallow curve from the top of the leg back three-fourths the length of the horse's back, to create the curve of the horse's belly. Start the rear leg above and inside the curve of the horse's belly. Draw a smooth, slightly upward-curving line backward until it almost meets the bottom of the horse's rear leg. Sketch in the bottom of the leg nearest you with three lines-two vertical and one horizontal at the bottom to define the hoof. Sketch in the other two legs, positioning them inside the legs that are closest to you. Add details to your basic horse shape. The horse's head is a good unit of measurement. From tip of the nose to back of the cheek it is one-fourth the length of the horse, and one-fourth the height of the horse.